a thousand words I cannot say. like the 11 o’clock news. and my lips could breathe. 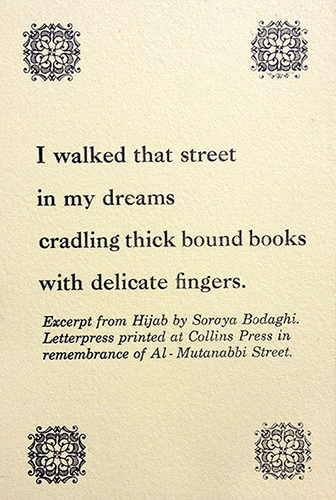 Read about the event in The Trail article Students Gather to Commemorate Al-Mutanabbi Street where this poem was read. My name is Soraya Bodaghi and I was born in Tacoma, Wa. I’ve lived on Fox Island, WA since the age of six. I went to Charles Wright Academy in University Place, WA before coming to the University of Puget Sound. Now, I work at Celebrity Cake Studio in downtown Tacoma designing cakes. I was brought up with a multi-cultural background with my father being Iranian and my mother being part German. I have always loved to highlight these cultures in my poetry and short stories. I was inspired to write this poem in recognition of the bombing that happened on Al-Mutanaabi Street in Baghdad. Unlike my peers, I chose to write from the perspective of a young girl in Tehran. I chose this perspective because I felt capable of imagining her emotions authentically. Although some people felt that my poem was unsympathetic, I felt that I had liberated my speaker. The poem of course is purely symbolic but it was meant to show that the unceremonious burning of ancient texts, specifically those written by men, gave this girl the opportunity to create her own place in literature’s history. Thus the bombing does free her emotionally from her oppressive society and gives her the encouragement necessary to put herself out there and to create a foundation for female writers of the Middle East to build upon. This was important for me to address as someone with family still living in the Middle East because women’s rights need constant attention much in the way that they do in America. I wrote this in hopes of contributing to the larger conversation about the oppression of women throughout the world.